Andrew Gignac is an Associate Professor of Music at San Antonio College where he teaches music theory, trumpet, and conducts the Jazz Ensemble. 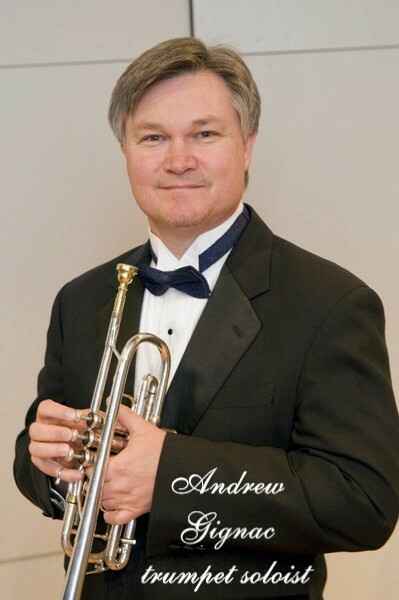 He is the principal trumpet of the Mid-Texas Symphony. He is also principal trumpet of the San Antonio Opera and performs regularly with the San Antonio Symphony. During the summer, Andrew performs with the Cabrillo Festival Orchestra of Contemporary Music in Santa Cruz, California. Gignac has performed as a soloist with Mid-Texas Symphony, the San Antonio Symphony Pops, the Victoria Bach Festival, and the Austin Chamber Music Festival. He has been a member of the San Antonio Brass since 1989, and has served as a member of its board of directors. With the San Antonio Brass Quintet, he is very active as a chamber musician and an educator. Gignac earned his Bachelor’s of Music from Sam Houston State University and a Masters of Music from the University of South Carolina with a concentration in Music Theory and Composition. Before joining the faculty at San Antonio College, Andrew was an Assistant Professor of Music at the University of the Incarnate Word. Andrew is married to Lauren Eberhart, a member of the San Antonio Symphony trumpet section. They are often featured together on recitals at weddings and in chamber music recitals. Their young daughter Julia is already a trumpet music lover.